Our brand page is designed to give guidance to both our team and our sellers on the correct application of our brand. Following the guidelines on this page ensures our brand is displayed consistently across web and print collateral. For more information, download the full brand guidelines below. This our primary logo and it should be used everywhere. The logo should only be displayed in the colours shown below. If you are unsure what these are, please see the colour palette section. There may be instances when you might want to use our logo on top of imagery. If this is the case, ensure that the image is a high contrast enough to allow the logo to stand out. Avoid using imagery that bleeds into the logo. Our icon is a device that can be used when our primary logo cannot be displayed. A good example of this is on social media or as a favicon. This should never replace the logo in environments where the primary version can be used. Another way that we protect our logo is by sticking to the exclusion zone. 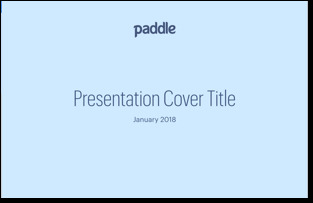 The exclusion zone for the logo is calculated by taking the ‘e’ out of Paddle and using the height of the character to form a protective zone. The exclusion zone for the icon is calculated by taking the height of descender of the ‘P’ to form a protective zone. This is the minimum clearance for our logo and icon. Where possible, leave as much space as possible. This is our colour palette. These are the only colours that should be used in any collateral. If you are using the palette, you can extend it by using tints. When using our colour palette, it’s important to pair the colours that contrast each other the most. Doing so helps key messaging, information and calls-to-action to be communicated with impact. Avoid using colours that do not contrast each other well. Not only will this help the colourblind, it will also help project our brand with clarity. Our font is Graphik. It is a sans-serif typeface that has a variety of weights. It’s extremey important to ensure that this font is applied to any outward facing collateral. This font is a key aspect of our brand and helps to project our personality. If you require the font, please contact a member of marketing. 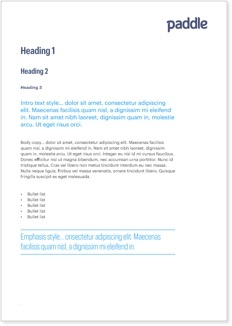 A range of templates has been designed for you to use when producing documents. They are available for anyone using Pages, Keynote or InDesign CC. It is important to make sure you apply the type styles already set in the templates. Avoid editing them without consulting the marketing team.